Welcome to March Eve! The month of March begins Fridayand teams begin their march to the NCAA Tournament field. Many smaller conferences finish up the regular season this weekend and begin their tournaments next week. Wednesday was a good day for teams on the bubble with almost everyone winning. However, for the one team that lost, it was brutal. Texas lost to Baylor 84-83 in overtime. The Longhorns blew a 19-point second half lead, but was able to scramble at the end and force overtime. Then, Texas got a six point lead in the overtime session, only to watch that slip away as well. The Longhorns dropped to 15-13 on the season. They have played a top 10 schedule and have a few very good wins, but this record is not good enough to get into the tournament. The schedule only gets easier in that they get two of their last three at home. 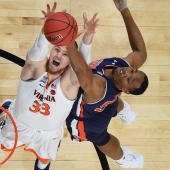 Auburn defeated Georgia 78-75. The Tigers blew a 14 point lead, but were able to come back in the end and beat the Bulldogs. This would have been a pretty bad loss for Auburn, but that is avoided for now. Now, they have opponents to build a resume against. Florida beat Vanderbilt 71-55 and is now 17-11 after picking up its fifth win in a row. The Gators are coming on strong and are one quality win away from maybe being in the bracket for good. That will have to wait, though. Florida hosts Georgia next. UCF beat South Florida 75-63. The Knights swept the I-4 rivalry and are starting to look like the team that was picked to win the AAC in the preseason. Coming up next, UCF travels to the team that will win it, Houston. Georgetown defeated DePaul 82-73 and took care of business in the first game against the Blue Demons. They still have to travel to Chicago for the rematch, but first, a game at home with fellow bubbler Seton Hall. I believe that if the Terriers finish SoCon play at 18-0, they are an at-large team entering the conference tournament. That means picking up a couple more road wins this week. Furman looks to avenge its only bad loss when they travel to Samford. The Paladins cannot afford another if they hope to sneak into the field. Belmont can clinch a share of the Ohio Valley regular season title with a win over the Skyhawks. The Bruins own the tiebreaker over Murray State by virtue of their win in the only game with the Racers. The Gophers gave one away at Rutgers and that makes this pretty much a must-win. After this, they play Purdue at home and travel to Maryland, so more wins may be hard to come by. Northwestern may be in last place in the Big Ten but this year, everybody in that league can beat you. The Sun Devils being their toughest stretch of their conference schedule with a trip to Oregon. They will also face Oregon State and Arizona on their season ended excursion. ASU did not have to travel to Washington this season. Saint Mary's resume leaves very little to recommend it as an at-large team, yet I still have them among the first four out. That's how soft the bubble is this year. The Gaels still get to play Gonzaga at home though. They cannot get caught looking ahead against the Pilots.